Jaipur : The Chief Minister of Rajasthan, Vasundhara Raje, flagged off the first flight of intra-state air services from Jaipur-Jodhpur-Udaipur on Tuesday. This initiative is expected to give a fillip to tourism sector in the state. 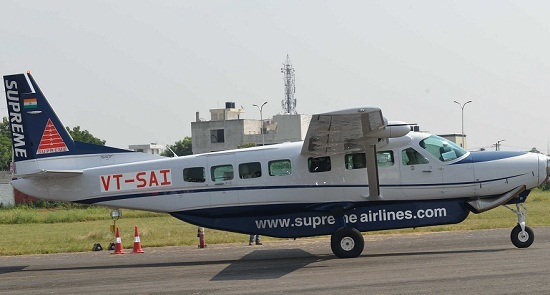 Raje along with Shri Gopaldas Ji Maharaj of Dadu Dayal sect flagged off the 9 seater aircraft of Supreme Airlines departed from Sanganer Airport State Hanger to Jodhpur. She handed over boarding passes to the passengers. She said, today a new era has ushered in the aviation and tourism sector of the state. The chief Minister said that, Bikaner and Kota too would soon be connected by air. She said besides the launch of intra-state air connectivity the state achieved another milestone a day before when Scoot Airlines services started direct flight from Jaipur to Singapore. These inititative will prove far-reaching to promote tourism in the state, she said. If these newly launched services get sufficient air traffic, soon major airlines shall also show their interest in the expansion of air services, she added. Raje said by generating awareness among our citizen about hygiene and discipline and by making our youth ambitious we can develop Rajasthan on the lines of Singapore. She called upon the youth to contribute positively in the progress of the state. Industries Minister Gajendra Singh Khinvsar, Tourism and Civil Aviation Minister Krishnendra Kaur Deepa, Minister of State for Energy Pushpendra Singh, MLA Ashok Pranami, Kailash Verma, Chief Secretary OP Meena, Principal Secretary Civil Aviation PK Goel and other senior officials were present on the occasion. Under intra-state air services, the 9 seater Cessna Caravan-C 208B aircraft of Supreme Airlines will fly 6 days in a week. The aircraft will take off from Jaipur in the morning at 10:15 AM and will reach Jodhpur at 11:30 AM. From Jodhpur it will take off 11:45 AM and will reach Jaipur at 1 PM. The evening flight to depart from Jaipur at 4:30 PM and will reach Udaipur at 6 PM. It will depart from Udaipur to Jaipur at 6:15 PM. The minimum fare for both the destination has been kept at Rs 3,499.